​In 1956, when The Questers numbered only 25 chapters, there was a desire for a national preservation project. Using ten cents per member, $270 was granted for flood restoration in Sturbridge, Massachusetts. The tradition continued until 1986 when the National Grants program was established. Today, the P & R program is funded by $2.50 per member from our Annual International Quester dues and placed into the Preservation and Restoration Fund. During the International President's first term of office, the President has the privilege of recommending her/his choice of a restoration project using the dues allocated to the P&R Fund for that year. Dues allocated during the second year of the President's term are used for the International Grants Fund. It is from this Grants program that chapters may apply for amounts of $500 - $6,000. With approximately 15,000 members, that comes to over $37,000 per year. Generous donations are also received from individual members and chapters. Arkansas also has a State Grant Program modeled on the International program with awards given in even-numbered years at the Annual Spring Convention. Grant amounts vary from year to year depending on the available funds. Guidelines and forms to apply may be obtained from the Members Only section on this site. REMEMBER: Grants are only given to Quester Chapters, and then, only if all guidelines are followed, forms are completed, and requirements for qualifications are met. Questers! Don’t let this deter you! We contribute our time, energy and money to fund important work to PRESERVE, RESTORE, and EDUCATE. Individual chapters should use the online resource to file for grants.You'll see that the tool is very easy to use and is broken down by state. All 501©3 nonprofit organizations should be directed to submit their request for support via our online portal which can be found at www.wellsfargo.com/donations<http://www.wellsfargo.com/donations>"
Through a combination of strategic partnerships with local and national nonprofits, grants, and volunteer activities, we’re helping to create stronger communities and growing local economies around the world. Wonder how many more corporate sources we are missing out on? These lists were compiled with input from chapter presidents and through research of State Meetings minutes and reports in the Trav’ler. Curren Hall. In 2012 The Arkansas Questers organization awarded Arkopolis $674.00 which the chapter matched with $100 of their own funds, for the purchase of six authentic period frames for displaying photos of original Curran Hall residents, maps and other significant items on the walls throughout the building. They Also shared in the cost of a pie crust lamp table for the museum Visitor Center. October 8, 2018-donate $100 to Perry County Historic Society to help pay for a foundation to move the century old Perry County Museum to city land where it can be placed on the Registry of Historic Places and turned into a museum. 2000-2007 Over-The-Jumps Carousel become a reality installed at the LR Zoo. While it was a community undertaking, Pinnacle restored a Horse/Chariot/name plates for the horses. Most Questers got to ride on the horses at the Grand Opening Ceremony. Pinnacle chapter, along with 4 other Central Arkansas chapters: Argenta, Arkopolis, LaPetite, and Quapaw chapters contributed to the purchase of a piecrust lamp table for Curran Hall, now the Little Rock’s Visitor Center. 2003 Contributed a place setting of Lenox china to the Grand Hall of the Governor’s Mansion. January 15, 2009 they presented $1000 to the Old State House Museum toward restoration of the gown of Mabel Claire Erwin Pittman Thomas Martineau who was the wife of the state’s 28th Governor (1927-1928). June, 2010 presented $7,500 to restore the Eula Terrell Terral 85 year old gown ordered from Paris, France, through B. Altman & Co., in New York City.. wife of the state's 27th Governor (1925-1927). North Little Rock Historic Commission is housed in a 1920’s fire station and exhibits items of historical interest to the city of North Little Rock. In February 2017 a Pinnacle member and her husband obtained two identical display cabinets, ca. 1880, in poor repair. Then they used their parts to cobble together and restore them into one beautiful cabinet so the Commission could securely display and highlight irreplaceable items. Their latest endeavor - In the Fall of 2017 allied w/Oakland & Fraternal Historic Cemetery Park (arboretum) in Little Rock was established in in 1863. On May 1, 2018 donated $1000 towards the chemicals needed to clean & restore Baby Land 2 headstones which had become cracked and buried due to a former caretaker laying them down for ease of mowing the graves. `1910 hand embroidered silk Edwardian walking suit and blue hat ostrich feathers. The suit is now displayed in the Fordyce Bath House in Hot Springs National Park on a “manikin” the Park curator named Emily, the Edwardian Lady. She is a dressed in the latest fashion of 1915, the year Fordyce Bathhouse opened. `Spring 2012 was the inception of an idea called "TOYS from YESTERYEAR" Vapor Valley put out the call for donation of old stored toys. They collected, researched, documented the toys and finally found a home for the collection at the Hillary Rodham Clinton Library in LR. Now they are putting voices to the display with a grant received last spring. There has been quite a bit of training on programming the voices. In 2016 The installation of the historically correct wallpaper in a bedroom of the Drennen Scott House. This P&R project has been one that our club has worked hard for and we will be privileged to have a plaque delineating our donation. We not only raised all funds necessary for this project, our members volunteered many hours working on various fundraisers and at the Drennen Scott House. 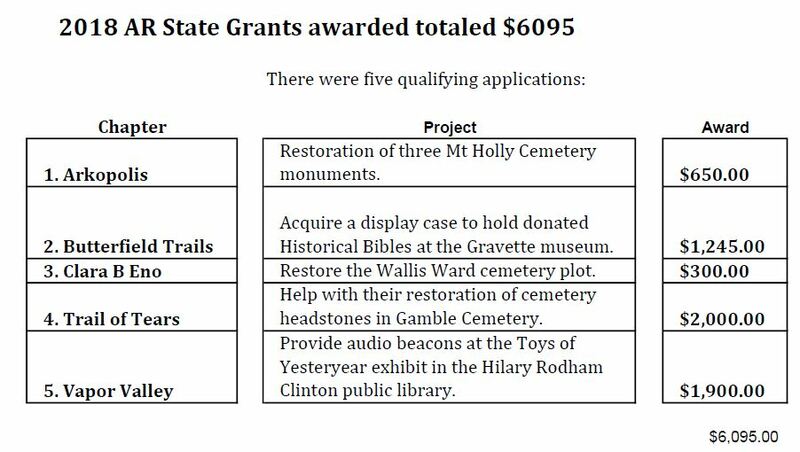 In 2018 awarded a grant to clean tombstones in the historically significant Wallace Ward Plot in the Fairview Cemetery in Van Buren. Plans are made with Randy Smith who is the head of the Cemetery Board and we are awaiting the student labor from the Van Buren High School History Club who have graciously agreed to do the heavy work for us. Once school starts, we should be able to complete this project over a weekend. Hopefully sometime in September. April 2006 Re-chink the Andy Lynch Cabin at the Peel Museum. 2016 Specialized Photographic Equipment for Benton County Historical Society to digitize documents. It is hot and stinky, but we have tried to make it fun, by working our shifts together. (chocolate) fundraiser and made $330. Indian Rock Fairfield Bay Log Cabin… As the US government prepared to build a dam site, Two log cabins, built in the mid 1850’s were saved from destruction. They were moved during the 1950’s, from what is now the middle of Greers Ferry Lake. The smaller of the two cabins was placed in Fairfield Bay, with a fireplace constructed from local stone and a mantle of rosewood, walnut and pine. IR has given untold number of volunteer hours staffing the museum through the years. a painting Rolled up and forgotten was discovered in the attic of an old house. After much research by the Rogers Historical Museum Staff, the painting was identified as the craftsman-style home of R. H. Whitlow, built sometime in the early 1900's at the edge of Rogers. There was a large arch crossing over the driveway adjacent to the house with letters which spelled DIXIELAND. To date, this painting is the only known image of the house. The Happy Rackensackers Questers' Chapter #906 paid for professional conservation of the painting which was believed to have been painted by a local artist. HR has been a long time supporter of the Rogers Historical Museum serving on their board. Calico Bluffs joined us Spring 2012 The old “Coal House” was turned into an old kitchen museum and Calico Bluffs Questers were asked to decorate the facility and help accumulate kitchen implements & artifacts from earlier times. Calico Bluffs Questers are busily hunting through their private collections and all the area antique shops for just the perfect items for their newest museum. Diamondhead Fencing with Plaque and upkeep of the cemetery on the Diamondhead Golf Course. Framed 7 African American Photos with a brass plate noting donated by Diamondhead Questers.